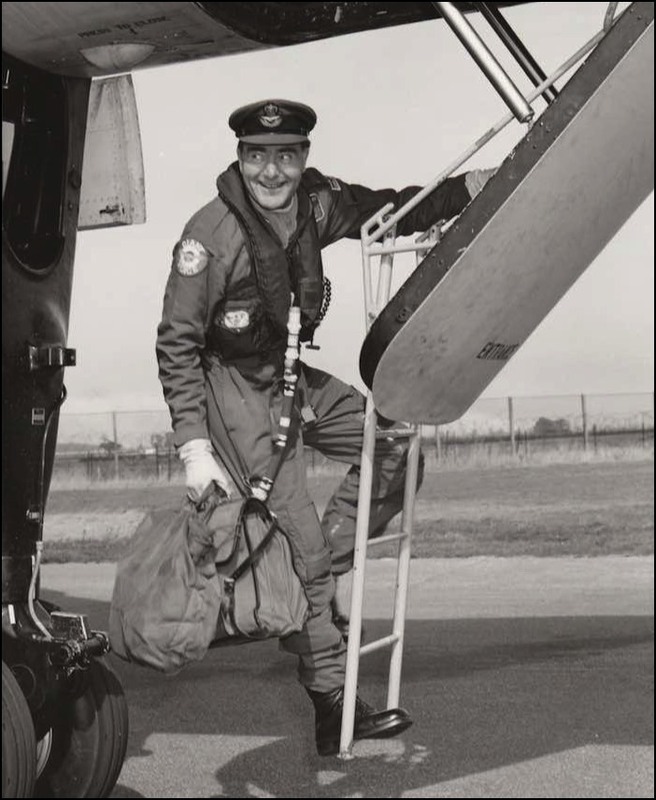 Phil Batty, having just chalked up 10,000 flying hours. I first met Phil Batty in the crewing-up process at 230 OCU, Scampton, in June of 1950. I was a newly-qualified Flight Engineer, recently arrived at the Lincoln OCU from St Athan in Wales. I ended up being the ‘babe’ (not yet having reached the age of 20 years) of an all-NCO crew captained by PIII Chas Lee. (Remember those dreadful NCO aircrew ranks of the early post-war days?) Phil was the signaller in the crew and was one of four seasoned members who had served during the war years. The remaining three of us, pilot, nav radar and myself, were post-war graduates who held these other experienced crew members in high esteem. Those were the days when NCO aircrew were mustered on parade every other Thursday in order to receive our small pittance in pay. I remember, as an EIV, I received the princely sum of 10 shillings per day (50p in today’s currency). However, one could buy a pint of beer for less than one shilling and a packet of 20 cigarettes cost little if any more, so one must view these things in context. In the ensuing fortnightly outings I suffered terribly from those ‘morning after’ blues and swore regularly never to drink again. Yet, with Phil’s gentle urging, I managed to step up to the bar after each pay day and, with perseverance, learned to actually enjoy the experience. It was, for all that, a painful upbringing. 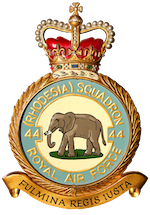 With the completion of the OCU course, our crew was posted to Wyton to join No 44 (Rhodesia) Squadron. That was just before the Squadron relinquished its Lincolns and converted to the B29 Washington - such luxurious beasts. We never flew together again as a crew. The conversion took place at Marham, where we were reassigned to different crews and, although always retaining our close association from the Lincoln days, remained separate until individually we were posted. For myself, the posting was to pilot training in Rhodesia and I lost touch with all the others, including Phil. The scene now changes and the clock is run forward many years until, following retirement from the RAF and migration to North America, I became aware of the existence of the 44 Squadron Association. On joining, I received a membership list and was more than mildly delighted to find that both my former skipper, Chas Lee, and Phil were members. Furthermore I had access to their addresses. Plans were soon afoot to meet again. Fortunately, my employment in international aircraft sales allowed me to plan my visit schedule such that a visit to the UK would coincide with an annual reunion at Waddington. That would have been sometime in the late 1980s. By then Phil too had retired and was already living in Wellingore; here I met Anne, Phil’s wife, for the first time. I recalled that the two had been courting in the days of our Lincoln training. Later, my own wife, Carol, was able to join me on occasional visits to the UK and the four of us shared many a happy evening in one or other of the glorious pubs, such as the ‘Marquis of Granby’, tucked away in Wellingore. We were even successful in convincing Phil and Anne to sample the delights of a Canadian summer, during which time Carol and I were able to show them some of the splendid scenic aspects of the country. We have remained close friends ever since. He and Anne even took time to join us for a few days during a vacation in Portugal, where together we sank a goodly number of bottles of Phil’s favourite ‘Cab Sav’ wines. Being a former AEO, it is perhaps not surprising that Phil turned his interests towards computing. It was during a visit to our home near Toronto that I introduced Phil to a computer game involving golf. I had been an avid golfer since taking up the game whilst instructing at Bassingbourn in the 1950s but Phil had never been drawn to the sport. He was, however, smitten by this computer version and before he returned to UK I provided him with his own copy of the game. We regularly communicated with each other via e-mail and Phil would happily report his latest ‘scores’ on various golf courses in the computer game. In one e-mail Phil, by this time into his 70s, announced that both he and Anne had decided perhaps they should explore golf more deeply by giving it a try on a real course. The next thing I knew, both had equipped themselves with clubs and joined a local club; they soon became quite addicted to the sport. I even had the great pleasure of joining Phil on a couple of occasions for a round. He loved his golf and continued playing whilst his health permitted. Phil was the most even-tempered man I have ever known - I never heard or saw him lose his composure, even after missing his third put! He had nothing but good to say of anyone whom he knew. He was such a gentleman and a perfect friend. When I think of Phil, I immediately recall his ever-ready, mischievous smile, the twinkle in his eyes and quiet laughter, which was infectious. His devotion to his pet dogs will also remain uppermost in my mind. Both my wife and I will miss him greatly and I know that his presence within the 44 (Rhodesia) Squadron Association will similarly be missed. It was my very great privilege to have known and flown with Phil Batty.